Recycled pressure washer water can be a source of contamination; ensure the system you use is properly maintained. It’s a constant challenge for boatyards: Supplying customers with an antifouling paint application that is long-lasting and effective. New coating formulas and manufacturers come and go; however, those who sell and apply the paint are ultimately responsible for its performance. In my experience, assuming the coating is sound and effective, proper preparation and application are the most significant factors in ensuring a coating’s successful performance. A number of years ago I managed a boatyard that was experiencing a rash of antifouling paint application failures. Essentially, the coatings were releasing from previously applied and otherwise sound coatings with alarming rapidity, racking up considerable warranty costs in the process. Although it took some time to realize this, because we used more than one paint product, failures seemed to have little connection with the type or brand of paint. After exploring all the (few) remaining possibilities I could think of, I eventually went back to basics, and asked myself, “Are we washing the bottom thoroughly enough?” The yard used an early generation pressure-washing runoff recycling system, which, as it happened, was malfunctioning, leaving behind an otherwise invisible film that guaranteed adhesion problems. 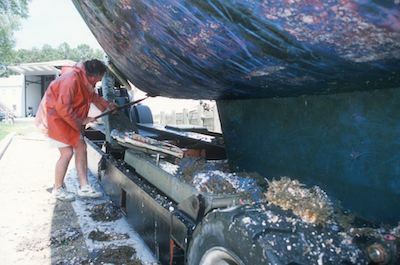 Subsequently, rinsing bottoms after pressure washing, with non-recycled water, for a few months proved the theory—the paint stopped falling off, giving me a newfound appreciation for the importance of surface preparation where antifouling coatings are concerned. To improve adhesion, it may be necessary to sand existing antifouling coatings, particularly the hard or non-ablative bottom paints. Virtually every paint manufacturer provides detailed instructions, explaining surface preparation and appropriate conditions for applying the paint. Nowhere is this more important than in the initial application. But when was the last time you read the application instructions on a can of antifouling paint? I did this a few years ago, thinking, “How complex can it be?” I was surprised to learn a few lessons. Among other things, it is highly desirable to combine an epoxy primer/barrier with antifoulant when first applying antifouling paint on new vessels and on bottoms that have been stripped of all paint. The bond formed between an epoxy barrier coat and the hull is tenacious, and the bond formed between the epoxy barrier/primer and the antifoulant is equally as strong (it is a chemical, or molecular, rather than mechanical bond), provided the antifoulant is applied within the specified chemical application window. Therefore, even if an epoxy barrier coat isn’t specifically needed, it’s a good idea to use one as a primer and tie-coat between the hull and first coat of antifoulant. 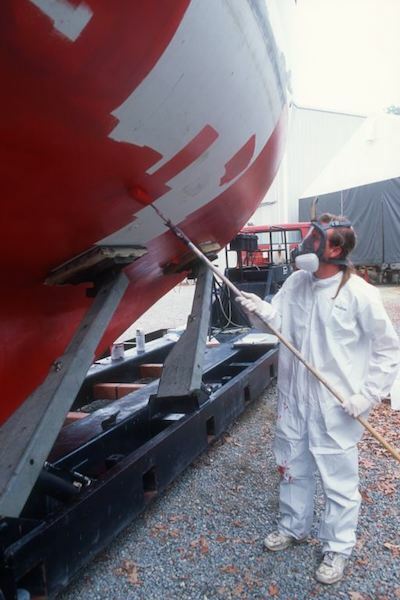 Most antifouling paint applications require the use of a respirator. The full-face variety, shown here, must be used by those with facial hair and offers the added benefit of eye protection, which should be considered mandatory. For subsequent applications of antifoulant two important criteria must be met. One, the paint being applied must be compatible with the paint that is already present. (Compatibility charts are available from most paint manufacturers and distributors.) Two, the surface over which paint is to be applied must be clean and free of all growth and debris (as noted earlier, even an invisible film can wreak havoc on a coating’s adhesion). When vessels are hauled and pressure washed it’s not unusual for the area beneath the slings to be overlooked. Once the slime in these areas dries, it turns a light buff color, which is easy to miss and is often simply rolled over with paint (the area just above the float line is notorious for this type of failure). Paint applied over these areas frequently releases shortly after the vessel is launched, allowing barnacles to strike. Additionally, because the bond between new and existing antifoulant is mechanical (rather than chemical) in nature, the new paint interlocks with irregularities in the surface, which means that sanding, while not always mandatory, is desirable. 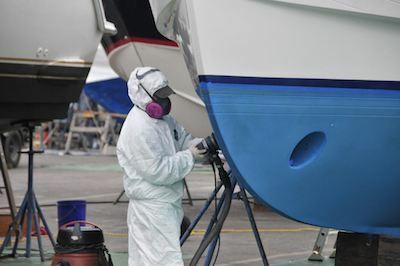 Because of its toxic nature, antifouling paint must be applied with caution. I frequently see this requirement ignored in yards wherever I travel. Applicators should wear gloves, coveralls, and eye protection as well as a properly fitted respirator, and not a dust mask (note that unless they are of the full face variety, respirators cannot be used by bearded individuals). One of the most important aspects of antifouling application, which can be disregarded particularly in cooler climates, is the minimum temperature threshold; nearly all antifouling manufacturers establish a minimum temperature for application of their product, often 45° to 50° F for air and hull temperature. If paint is applied when the temperature is lower, it may fail to flow over or adhere to the existing paint. The same holds true for barrier/primer coats, which are also temperature sensitive. Hull temperature, unless in direct sunshine, nearly always lags behind that of the air, which means that if the air temperature reaches 50°F by midmorning, it’s possible that the hull will remain less than 50°F until afternoon. If in doubt, measure hull temperature with an infrared pyrometer. 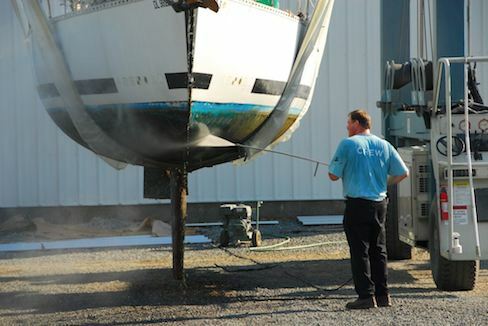 Properly applying antifouling coatings will result in better fuel economy and less scraping and pressure washing at haul-out time (which mean more satisfied customers). Every attempt should be made to apply paint evenly, completely covering the existing coating. Painting on a breezy day can make this difficult as paint tends to dry too quickly, making rollers sticky and less absorbent. Finally, unless the paint manufacturer specifically calls for it, do not thin antifouling paint. Thinning is false economy; it simply dilutes the paint’s antifouling properties, which will result in shorter lifespan.